DHAKA, Jan 14 2019 (IPS) - It was the first time in the history of parliamentary elections in Bangladesh that a party won with such a huge margin. But according to local analysts familiar with Bangladesh’s political climate, the victory by the ruling Awami League (AL) led coalition—which won over 96 percents of seats in parliament in the country’s 11th national elections on Dec. 30—was expected in the face of the country’s unprecedented development. Growth in this South Asian nation has overtaken that of many developing nations. “Bangladesh’s economic growth rate hit record 7.86 percent, per capital income has reached 1,751 dollars, exports reached 42 billion dollars annually and the sustainable development goals (SDGs) indicators show we are on the right track. Now having said that, I think the overwhelming majority of the voters understand the development trends and so they chose rightly their leaders,” Professor Abu Ahsan Mohammad Shamsul Arefin Siddique, former vice chancellor of the University of Dhaka, told IPS. According to the World Bank, the country is predicted to continue to have GDP growth in the 6.5 to 7 percent range well into next year, with key growth drivers being exports (the country’s ready made garments sector has driven this), manufacturing growth, and services. Led by Sheikh Hasina, the victory of her ruling party confirmed her as the Prime Minister for a record third consecutive term. In the final results AL and its allies won a total of 288 seats in parliament while the opposition Bangladesh Nationalist Party or BNP, which is a member party of the coalition Jatiya Oikya Front (National Unity Front), secured only five. Jatiya Oikya Front is a coalition of opposition parties comprising BNP, Gono Forum, Jatiya Samajtantrik Dal and Nagorik Oikya. There had been criticism from many that BNP had ties to banned Islamist party Jamaat-e-Islami. However, Gono Forum leader and founder of the coalition, Dr. Kamal Hossain, acknowledged the negative impact on voters and added that he would not have wanted the alliance to include Jamaat if he had known about their inclusion by other party workers. A further two seats went to members of the Jatiya Oikya Front alliance. Hasina’s vision for women’s empowerment, educating girls and giving women a greater voice, has contributed to social changes and the country’s economic transformation. The country, which according to the World Bank has considerably reduced poverty from 2010 to 2016 (the rate has since slowed), is expected to obtain the category of a Middle Income Country by 2021. The government also promised to generate 40,000 megawatts of electricity to fuel economic development. While Hasina’s government has made huge economic progress, the Prime Minister has also been recognised by the global community for her role in giving shelter to the persecuted Rohingya refugees. She opened the doors for over a million Rohingya’s while many nations have been onlookers. The election was not without issues as BNP and it’s alliances claimed irregularities in the election process after violence was reported in 23 out of a total of 40,000 polling stations. Sixteen people died in clashes that ensued. Hossain, meanwhile, urged diplomatic mission heads in Dhaka to engage with the AL government to pursue holding fresh elections under a non-party administration immediately. Many have questioned how AL received such a huge number of votes when the main rival, BNP, which was popular in previous polls and traditionally won seats, lost so miserably. Reza Kibria, who contested the elections under Jatiya Oikya Front and lost, told IPS: “The so-called election was a farce and it was a shameful episode in the history of our country. The vote rigging took place in a wide scale and it was centrally directed.” Kibria is the son of the slain Shah AMS Kibria, who was the finance minister under the Sheikh Hasina-led government in 1996. He said that about 30 to 40 percent of the votes were cast before the voting opened at 8am and that polling agents from opposition parties were not allowed to enter the voting centres to check whether the ballot boxes were empty. Kibria’s critical remarks, however, were not supported by any evidence or specific details or a record of the irregularities. Authorities have denied the allegations. Iqbal Sobhan Chowdhury, the Press Adviser to the Prime Minister, and also editor of Daily Observer, told IPS that the Jatiya Oikya Front and BNP leaders had failed to act as a responsible political party and convince general people that the alliance, if voted to power, could be a better political party to steer the government. “It would be a huge challenge for the government to rule for the next five years without an opposition. So when there is no opposition there is hardly any healthy critique and without such criticism politics may be difficult,” Murshid added. But she pointed out that since the government has huge confidence and a mandate from the people it must investigate the alleged election irregularities. It would give the government more credibility if they did so, she said. The Prime Minister has stated that with regards to complaints of irregularities, legal processes will be followed. They are being investigated by the Election Commission of Bangladesh (EC). “Since the EC did not receive any evidence of unfairness in voting, the EC considers the election to be fair,” Khanam added. The South Asian Association for Regional Cooperation (SAARC) Human Rights Foundation, and the Election Monitoring Forum, two independent entities, described the election as ‘peaceful’ and ‘organised’. Despite the allegations of vote rigging and sporadic violence, the election was considered generally well organised and monitored. The scale of the election was enormous. In a nation of 160 million people, there were 106 million registered voters, including 20 million newly-registered youth voters. Voter turnout was above 80 percent. A total of 25,900 representatives from 81 local observer bodies, 38 foreign observers, 64 officials and diplomats from foreign missions, and 61 Bangladeshi nationals working in overseas organisations, were present. However, there were fewer monitors than previous polls. Many election monitors were not allowed to participate in their professional duties as they reportedly did not register on time, according to the EC. One of the prominent features of this election was the level of security. Over 700,000 security forces, including the army, were on tight vigil round the clock. Out of 40,051 polling centres, violence occurred in 23 centres, which statistically was less than 0.06 percent. 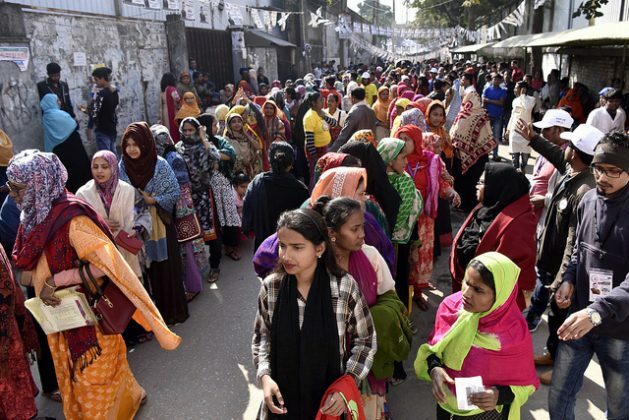 “I have never seen such a huge number of security men around polling centres,” remarked Mohammed Zakir Hossain, 73, who has been voting since 1970. Such security measures perhaps raised the confidence and level of enthusiasm among the voters, which is why the queues at most of the centres, even in remote areas, appeared very long. He also called the elections free and fair. Despite the claims of irregularities, the election was well accepted internationally. The Indian Prime Minister Narendra Modi, Chinese President Xi Jinping and Russian President Vladimir Putin were among the first world leaders who congratulated Hasina.